On a visit to my hometown I recently went to see "Frida Kahlo: Through the Lens of Nicholas Muray". This exhibition of 46 photographs is currently touring the United States. These portraits of her stare sensuously at the camera: Frida in her Tehuana costume, Frida posing with an eagle, Frida wearing earrings of tiny, severed plastic hands given to her by the surrealist, André Breton. Frida was the wife of the Mexican muralist, Diego Rivera, who was unable to be faithful to any woman. The Riveras had a tempestuous marriage and, to hurt him, Frida look lovers, among them Leon Trotsky and Nickolas Muray, a Hungarian photographer who had immigrated to New York City. 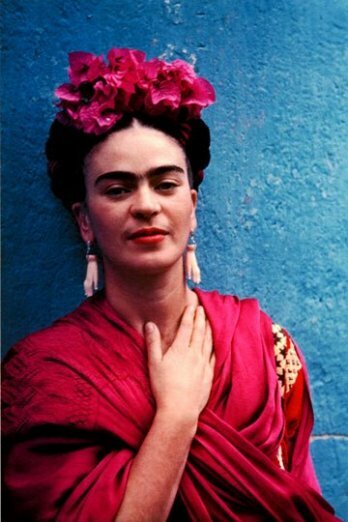 Muray became internationally known as a portrait photographer, but he became famous for the many portraits he took of Kahlo. Their affair lasted ten years. To see the many pictures he made of her is to follow the waxing and waning of their love. Muray photographed Kahlo not only with great artistry and skill, but also with extraordinary feeling. In the exhibition was a reproduction of a love letter Frida sent Muray. In it she enclosed an impression of her lips with her signature fire-engine-red lipstick. This is specially for the back of your neck. Despite Diego’s many betrayals, including an affair with Frida’s sister, Cristina, Frida always loved Rivera which explains why Muray wrote this plangent sentence, "The one of me is eternally grateful for the happiness that the half of you so generously gave." I think of Kahlo as a novelist in paint because her pictures are a series that chart the events of her life and her emotional reactions to them: her broken body, her inability to have children. Muray let us see the woman behind them: proud, passionate, sometimes cruel (she made him photograph her kissing Diego). Hayden Herrera has written a mesmerizing biography of her, Frida, and the British poet, Pascale Petit, recently published an excellent book of poetry, What the Water Gave Me: Poems After Frida Kahlo. Both highly recommended. Frida’s last, defiant painting was executed eight days before her death. Bedridden and in great pain, she chose as her subject the most beloved Mexican fruit: watermelons. Whole, halved, serrated, sliced. In blood-red oils, she depicted the lusciousness of their dying flesh. Should anyone miss her meaning, she painted in capital letters on the glistening pulp of the wedge nearest the viewer, VIVA LA VIDA. Viva life.